YOUNGSTOWN, Ohio – Students from the Youngstown State University Williamson College of Business Administration attended a professional development summit Friday to learn about employers’ expectations of them, and how many of those employers recognize the need to adapt to the incoming workforce. Some 100 sophomores and juniors attended the morning-long conference at Williamson Hall. The primary goal for the summit was for students to put together a professional development action plan. The college has held the summit since 2013, said Christina O’Connell, director of the college’s Center for Career Management. “It’s for our students to know and understand what they need to do during the next two years of their college career to be successful,” O’Connell said. “Today is an opportunity for you to think a little more closely about how you are going to be developing your own professional portfolio over the next couple of years,” said Betty Jo Licata, dean of the college. The mission of Williamson College is to prepare students to be successful business leaders, but much of that happens outside the classroom, she told them. The students divided into two groups to attend different panels — one featuring employers and the other alumni and students — then switched rooms after the first round. Participants in the workforce panel discussed opportunities and expectations for interns as well as new hires. The job market created by the retirement of baby boomers will create “a tremendous opportunity,” said Todd Finn, trust investment officer for Farmers Trust Co.
“We take new graduates with very little experience all the time,” said Angelina Henderson, manager, college relations and recruiting, for the Goodyear Tire & Rubber Co. Those hires go through a development program before being placed in a permanent, full-time position with the company, she said. When Cohen & Co. hires interns, the goal is to develop them into full-time employees, said Trinette Simon, senior manager. She characterized the internship as a “job interview” that lasts three or four months. Chris Allen, North America talent acquisition manager for Vallourec, advised students that employers expect incoming hires to be mobile and able to work at different locations, even some less-desirable ones, particularly if they expect to rise in the ranks of the company. Trinette Simon, senior manager at Cohen & Co., and Chris Allen, North America talent acquisition manager for Vallourec, advise students. The panelists acknowledged hiring managers are often concerned when they see candidates for positions who have done a lot of job hopping, or not staying at one employer for very long. Emily McHenry, community engagement and training specialist for Youngstown Area Goodwill Industries Inc., worked as a teacher before being hired by Goodwill about five months ago. She admitted she would change jobs every three or four years, something Goodwill’s director asked about when he hired her. The answer she gave made her boss feel more assured about hiring her. “Just explain. Be honest, be truthful,” she said. At the same time, while employers are cautious about a job-hopping history, some of the panelists acknowledged that’s a reflection of the changing nature of the workforce. Sometimes people will move on from entry-level positions because they feel they haven’t advanced quickly enough or another opportunity comes along, Finn said. “There is a responsibility of the business to keep you engaged, to keep moving you along, give you opportunities for growth. Because the evidence is pretty clear: millennials do get stir crazy if they don’t feel like they’re getting opportunities to grow and develop,” he said. While employers are cautious about job-hoppers, panelists Emily McHenry and Todd Finn acknowledged that it’s a reflection of the changing nature of the workforce. In more traditional industries like manufacturing, sometimes it’s difficult to get personnel who have been at a company for 20 or 30 years to understand the more transient nature of the workforce now, Vallourec’s Allen and Goodyear’s Henderson acknowledged. “Especially in manufacturing, I have to give you some leeway with that because that loyalty of that job that you’re going to have 25 or 30 years at one company doesn’t exist anymore. So you have to make people comfortable that they’re allowed to go and to come back,” Allen said. Goodyear has several associates who have been with the company for 30 or more years, which has become the expectation of much of the leadership there during most of the same period, Henderson said. While she advised students to find ways to diversify their experience within the company, she acknowledged that leadership has to start to change its mindset to let associates know it’s OK to not stay in one place for 30 years. Allen said he always takes back these “boomerang employees” who leave for a few years then want to return. “Somebody else paid them to get a little bit more experience,” he said. 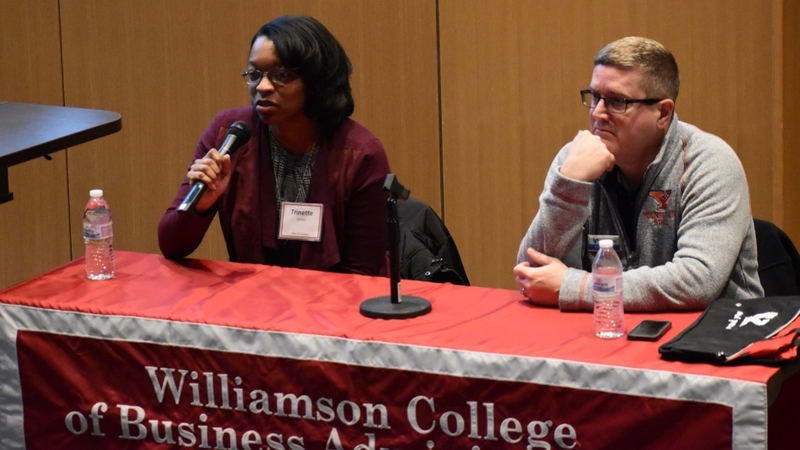 Students also heard from a panel of eight Williamson alumni and students about their experiences seeking internships and jobs. 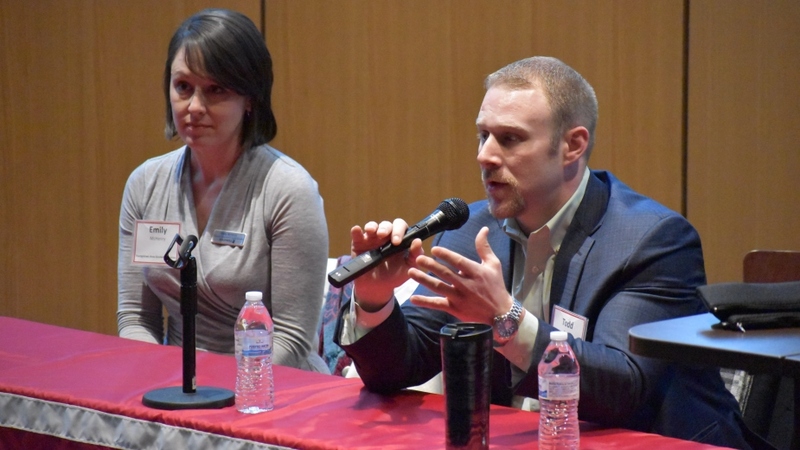 Panelists urged students to take advantage of the opportunities that YSU provides such as “meet the employer” events and discussed using online tools like LinkedIn and Handshake, a network for students and recent graduates. “I was surprised at how much I didn’t know because I was used to understanding things,” admitted Bryan Schiraldi, credit analyst with Farmers National Bank. The experience was frustrating until he realized learning how to do things was the point of the internship. Many internships aren’t structured, said Jean DeAngelo, a private client associate with W3 Wealth Management who was hired to her full-time position through her internship. Such internships allow interns to tailor their experiences to the skills they bring. “Always take initiative,” said Tyler Crockett, a senior finance student and internal auditing intern at 7 17 Credit Union. Trisha Mossor, a ground transportation consultant with Enterprise Holdings, discussed leaving a position after just three months because her code of ethics “just didn’t line up” with her employer’s, she said. She consulted with O’Connell about what to do and how to overcome potential objections from a prospective employer about searching for a new job so soon. “Basically, the best thing to do is just be honest,” she said. She also suggested being upfront in addressing the issue with the interviewer. Schiraldi acknowledged he has changed jobs twice just this year. Students were pleased with the insights they took from the panelists. The best part was the advice about resumes and interviews, said Megan Watt of Hermitage, Pa. Watt is still deciding between majoring in advertising or marketing. She is hoping to get an internship this summer and felt what she learned makes her more confident going into interviews. “In the business school, it’s really important to do an internship or at least be able to network and talk to people,” said Rachael Leonard of Struthers, a business administration major with a minor in finance. The program also provided an opportunity to network with the professionals, “successful people that you would one day like to be like or you want to be working with” to be successful, added Collin Harden of Youngstown, a junior majoring in hospitality management. Pictured above: Betty Jo Licata, dean of the Williamson College of Business Administration, addresses some 100 students at this year’s professional development summit.